Often the new bands come out ripe with a new single, credible singer, and a pop anthem that sets the charts ablaze, but little else. A year later, where'd they disappear to? What hasn't been copied, cut and re-created over and again under another name? But I dig what I'm hearing with Moments In Grace, so much so I had to write about 'em. Already compared to big selling impression builders like Thrice, Thursday, the Movielife, and Hot Water Music, Moonlight Survived captures elements of all of the above along with Days Like These?s incredible Charity Burns Green record, with an emotionally inspired work that's guitar rock at its core, soulful and mature (and thus emo? ), and the perfect production blend of spit and polish. Moonlight Survived right from the opening moments of first single and first track, "Stratus" with uplifting dynamic design, to the power lines in the foreground of the front cover's dark sky, to the emotional mellowness of "The Past" at the close, is a winner in every way. What yesterday's heroes like Cheap Trick, U2 and The Police had that so many of today's overanalyzed tail-riders are missing in an oversaturated market? well the first IS probably the oversaturated market, but the ability to craft good songs; it's clich? and too simple, but it's true. Too many albums with too many songs and not enough attention to detail. Where's that pleasing distinction from song to song to tell the listener they didn't spend all that money just to hear the radio track and maybe one or two more before shelving it and forgetting? 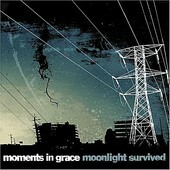 Moonlight Survived is a complete album that employs rugged guitar strides tempered with smooth melodies, sharp hooks, and anthemic verses that carry a tune?s ability to go further than fast-forward and forget. Vocalist Jeremy Griffith is a true singer that swoons, soars, and centers himself within the song context without overstriding. In a crowded scene of singers that are part-time crooners and caged lions, his range and delivery is a step beyond most. Right from the opening moments of first single and first track, "Stratus" with its palpably soaring dynamics, to the edginess of "The Patient," the emotive contrasts of the haunting hypnotic "Distant and Longing Light" and metallic strains of "The Blurring Lines of Loss," to the power lines themselves, in the foreground of the front cover's dark sky, Moonlight Survived is a complete package and a winner in every way.